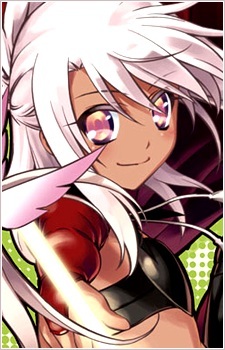 Kuro, initially referred to as Dark Illya, is a being created from Illya's hidden power and the Archer Class Card. She comes into existence after Illya uses the Class Card in order to save herself, and afterward, she falls unconscious and wakes up to find the card missing and an exact duplicate of herself, with the exception of dark skin and the Archer outfit, in its place. Kuro immediately escapes and makes various attempts on Illya's life, stating that they cannot both freely exist. She is eventually captured and has a seal placed upon her that forces her to share all sensations with Illya, including injuries and pain. Unable to freely fulfill her goal, she attends Illya's school as her cousin, Kuro, though she still holds resentment towards Illya. She is at odds with Miyu, who wishes to kill Kuro in order to protect Illya. The nature of her existence is eventually revealed to be Illya's sealed memories as a Holy Grail. When Kiritsugu and Irisviel stole Illya from the Einzbern family before she could be fully configured as a Grail, they also sealed her memories of these events to help her have a normal life. Unbeknownst to them, however, these sealed memories continued to exist, becoming a hidden second personality within Illya's mind. Eventually, this personality became powerful enough to harness the Archer class card and create a body for itself, becoming Kuro. Kuro is deeply bitter as a result, both towards her parents for sealing her, and toward Illya for wishing to be 'normal' (and thus indirectly wishing for Kuro, the manifestation of her past as part of a Magus clan) to not exist. She eventually comes to terms with her anger after Illya finally accepts her, only to begin breaking down shortly after. Although on the verge of death, Illya is able to convince her to fight for her new life, making her admit that what she wants most is not to be a Magus, nor to kill anyone, nor even to be accepted: most of all, she just wants the chance to live. This admission is enough for her powers as an incomplete Grail to activate, granting her wish to live and stabilizing her body. She is then formally adopted into the extended Einzbern family, being introduced to Shirou as Illya's cousin.